Can’t wait to start the hives up again in the new house! I’m lucky to live in close proximity to the Lady Bird Wildflower Center. It is a great place to visit to learn about native plants, and they recently installed some hives on their property. Below is a video of Dasylirion whelleri or Common Sotol in full bloom. From the video, it looks like the bloom stalk is covered in bees. This plant is a good addition to any garden in the southwest. I took a visit to the bee friendly south Austin site yesterday to get the site ready for the hive. I just received e-mail confirmation from Bee Weaver that I will be able to pick up my packaged bees on either April 10th or 11th. I was a bit worried that the colder and wetter winter here in Texas would delay bee shipments, but I’m happy to report that is not the case. 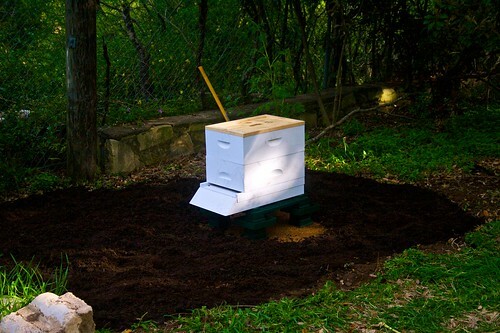 Tomorrow I’m heading down to the bee-friendly south Austin site to prepare the area where the hive will live. I found the blog of an Albuquerque based beekeeper, and she has video of a praying mantis at her hive. At my last beekeeping class, we also found a mantis near the teaching hive chowing down on some tasty bees. 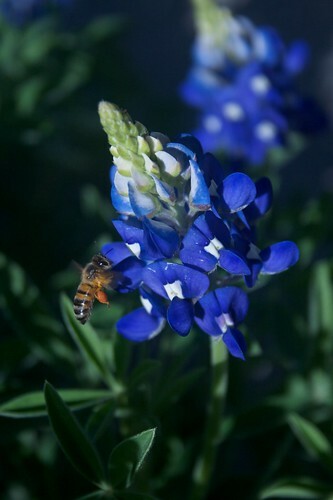 I love bees, and I love bluebonnets so this photo combines them both.